"Arturia Roland Jupiter-8 & Minimoog"
The Jupiter-8V is the newest addition to the family Arturia’s analog synthesizer recreations. 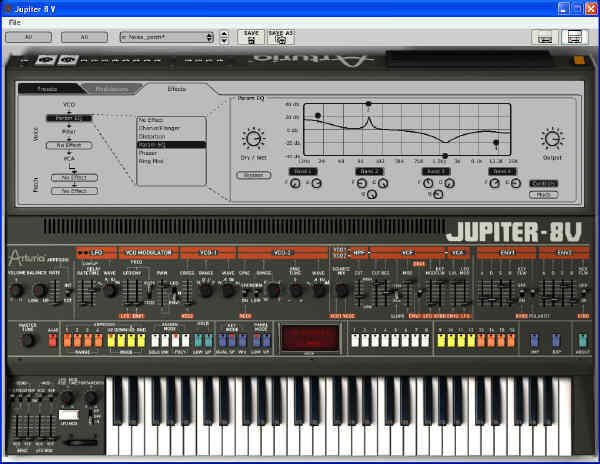 Offering the unique sound palette of the Roland Jupiter 8, this virtual version is a sound designer’s dream. A set of Analog Sounding Effects: Dual Delay, Phaser, Flanger, all three being largely module able by any audio source in the synth. Back to the early 80’s, the Prophet 5 and Oberheim OB series dominated the polyphonic synthesizer market. Having that in mind the Jupiter-8’s success, initiated in 1981, took every one by storm. But what made the Jupiter-8 so successful? Well, in terms of sonic possibilities, it complemented its competition by bringing something different. The Jupiter-8 was capable of creating very versatile sounds. You could easily make 'fat' or ‘Crystal’ sounds with it. In fact, the Jupiter-8 sounded the way it looked, ‘sleek and polished’. The electro-pop community became quickly convinced by the qualities of the Jupiter-8. 'Relax', by Frankie Goes to Hollywood was produced incorporating a Jupiter 8, and players such as Vince Clarke, John Foxx, and Martyn Ware were also using it. The path to classic status of the Jupiter started there. Other artists that have used The Jupiter-8 include Tangerine Dream, Underworld, Jean Michel Jarre, Depeche Mode, Prince, Gary Wright, Adrian Lee, Heaven 17, Kitaro, Elvis Costello, Tears for Fears, Huey Lewis and the News, Journey, Devo, Freddy Fresh, Simple Minds, Jan Hammer and BT. The Jupiter-8 offers a very interesting combination of a high-pass non resonant filter and a low-pass resonant filter. The arpeggiator and the keyboard split make it a remarkable performance keyboard. Fast envelopes and precise oscillators confer to the Jupiter-8’s sounds its famous versatility. The Galaxy allows the user to choose from different LFO types and intertwine them together into a single unique modulation source, giving a new evolving element to the sound of the Jupiter 8. The Jupiter's step sequencer is also an assignable modulation source, which allows for easily generated patterns to be used to control the many interesting parameters of the sound. The Jupiter-8V application is delivered with a USB key containing your Jupiter-8V license and authorizes the software to function. To use the software on a different machine, simply install the software on that computer and then plug in the USB key. In this way, you can use this system key to install licenses of other Arturia products, or other products that use Syncrosoft technology, and carry the license from computer to computer as you wish. In order to function correctly, the USB key driver must be already installed on your system. The installation program for the Syncrosoft License Control Center is available on CD-Rom and will be launched automatically when you install the Jupiter-8V. Your license number, and thus the key on which it is installed, represents the true value of your software. To lose the USB key is to lose the use of the software on which the licenses are installed. Take special care of this USB key. Click Here For "Howard Jones" Real Player (9.7 MB 'FLV') Video File Demo of The Roland Jupiter-8 Performance. Click Here For "Sonic Lab" Real Player (18.8 MB 'FLV') Video File Demos of The "Arturia" Roland Jupiter-8 Performance. Click Here For "MusiKmesse 2007" Real Player (10.5 MB 'FLV') Video File Demo of The "Arturia" Roland Jupiter-8 Performance. Click Here For "Nori Ubukata" Real Player (9.32 MB 'FLV') Video File Demo of The "Arturia" Roland Jupiter-8V Performance. 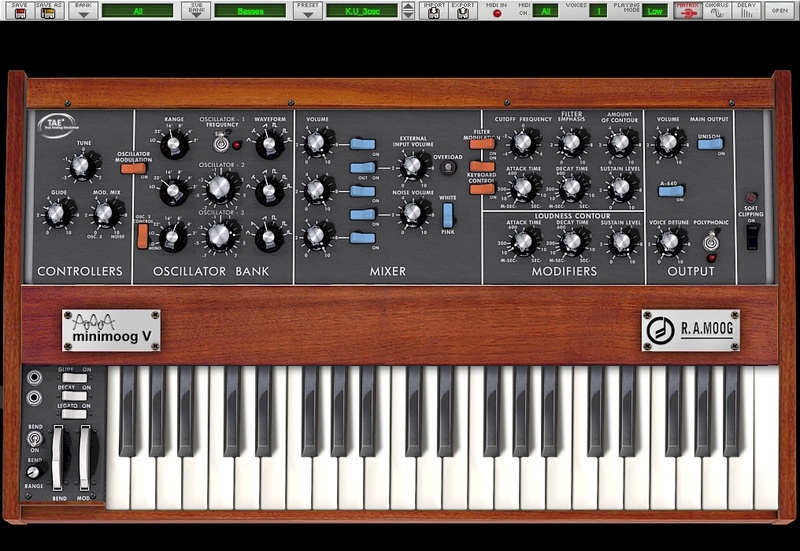 Click Here For "MiniMoog Historical Synth" Real Player (Mini Moog-V history 6.45 MB FLV) Video File Demo of The "Arturia" Mini Moog-V.
Click Here "Holy Grail Of Synthesizers" For Real Player (Mini Moog-V 8.69 MB FLV) Video File Demo of The "Arturia" Mini Moog-V.